Top Page >> List of Products >> Display Items, etc. We handle various kinds and types of products. Those related to samples as below are also available. 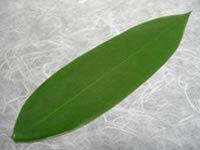 This bamboo leaf was processed specially so as to improve the feel of its material. For display please use it in a case enclosed with Fu manju or dried wheat gluten bun or Mizu manju or sweet jellied bun, besides using it as an accent on a set product. 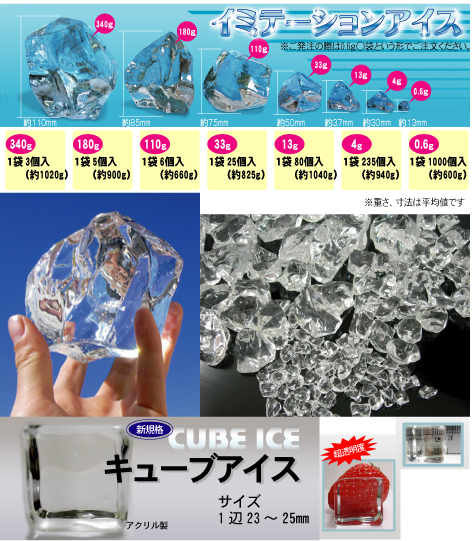 Seven sizes are available for our ice blocks and each of them is sold in a bag. Enquire us for the size and quantity of each. With confidence we would recommend these ice blocks for their transparency and the feel of the material they are made of. 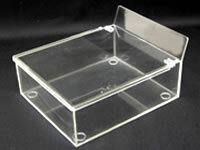 Large one and small one are available for our sampling box and each of them has a top cover. We will also manufacture a sampling box in an original shape if neither of these can correspond to your store. We also produce a mold for a miniature and produce or create a mold for a strap key holder. Because the entire process from manufacture of a product to design of its package is conducted consistently, it is possible to complete them in a total producing operation, including production of a mold for a strap key holder.